The QPi by Howard Leight balances workable noise levels with advanced hearing protection and intelligent communication. Available from Sperian , it is an intelligent communication device and hearing protection system developed especially for workers in industrial environments. Hearing protection is essential in noisy environments. But so too is ensuring workers remain aware of their surroundings and can communicate clearly at all times. Originally used by US military and NATO forces, the robust yet lightweight QPi ensures users are protected from hazardous noise while they remain aware of their situation with full directional hearing. 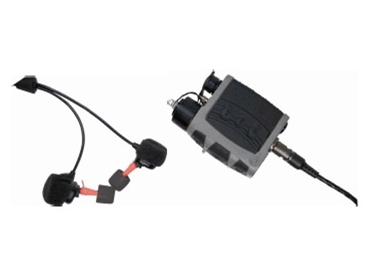 A headset with microphones and loudspeaker, a control unit and a radio cable that is compatible with most two-way radio devices make up the QPi. The QPi can be used with all ground, vehicle and aviation helmets and personal protection gear. The QPi earpieces contain two miniature microphones and a loud speaker so that voices are picked up and sound is reproduced within the ear canal. This ensures the user’s voice is clearly identifiable when transmitted over radio. And to protect against exposure to continuous noise, active noise cancellation eliminates low frequency noise for enhanced hearing. The QPi’s unique impulse noise response and sound leakage alert features make it unique. As soon as the QPi earpieces are placed in the ear, the device immediately tests for and alerts workers to any sound leakage. Once the earpieces are correctly in place, advanced digital technology analyses all surrounding sound and continuously adapts hearing levels to provide full protection. The worker with QPi hearing protection can also easily minimise disturbing sounds or amplify sounds where necessary. And to protect against the significant hearing loss threat posed by impulse noise, the QPi rapidly responds to hazardous noise by shutting out harmful sound within 0.1 millisecond of its detection. The QPi then automatically re-opens as soon as safe noise levels resume. This feature ensures the user is fully aware of their environment and can respond effectively in critical situations.